Bennison is an English Company specializing in hand-printed fabrics based on 18th and 19th Century English and French textiles, originally discovered and reproduced by the late, renowned antique dealer and decorator, Geoffrey Bennison. Our collection has grown to include patterns with more recent origins including specially commissioned works, though the criterion has always been to choose designs of harmonious tone and scale that Geoffrey would have liked. We create fabric that is timeless yet of its time. Our designs are printed in small batches in England on linens and silks woven and dyed exclusively for us with characteristic slight variation between dye lots. And all of our patterns can also be printed as wallpaper. Geoffrey Bennison (1921–1984) ranks among England’s most influential designers, defying conventional notions of style to conjure up magnificent settings for discerning clients who loved his theatrical and romantic sensibility. The master of the layered look, he used antique textiles with his own fabrics to achieve a complex mix of scale, pattern, and color in inventive shades such as his evocative Red Riding Hood Red and Prussian Blue. His talent for combining eclectic objects, his unerring eye, and his deep knowledge of antiques earned him a reputation for sophisticated originality equaled by very few. This lavish volume opens with an illuminating text about Bennison’s fascinating history—from his early days at the Slade School of Art and his work as an antiques dealer in London during the swinging sixties to his later career as an interior designer. From decade to decade, the influence of Geoffrey Bennison has gathered momentum. At first his name was known only to the cognoscenti of the decorating world, but as the 1980s progressed into the 1990s, a gradual undercurrent grew, at first barely discernible, its ripples widening at the watershed of the twenty-first century. Now, thirty years after his untimely death, Geoffrey Bennison is recognized as one of the greatest interior designers of the twentieth century. 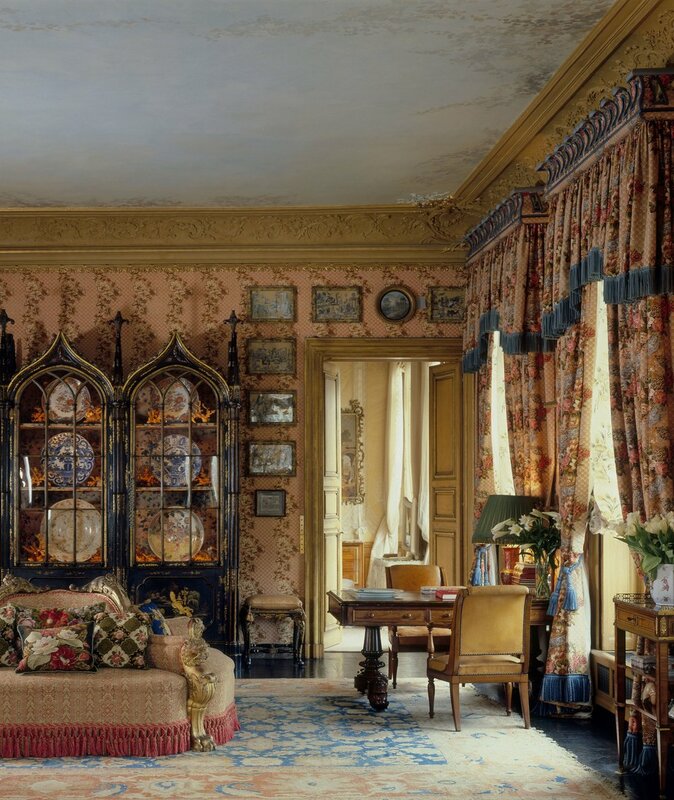 He ignored the accepted views on style and taste to evoke a particular ambience, combining antique textiles with his own hand-printed fabrics to create richly beautiful interiors for his sophisticated and discerning clients. His gifts as an interior designer were based on solid foundations – formal art school training, a deep knowledge of antiques, and an unerring eye. His flair and originality ensured that he was in constant demand as a decorator, with a legacy that lives on to this day. 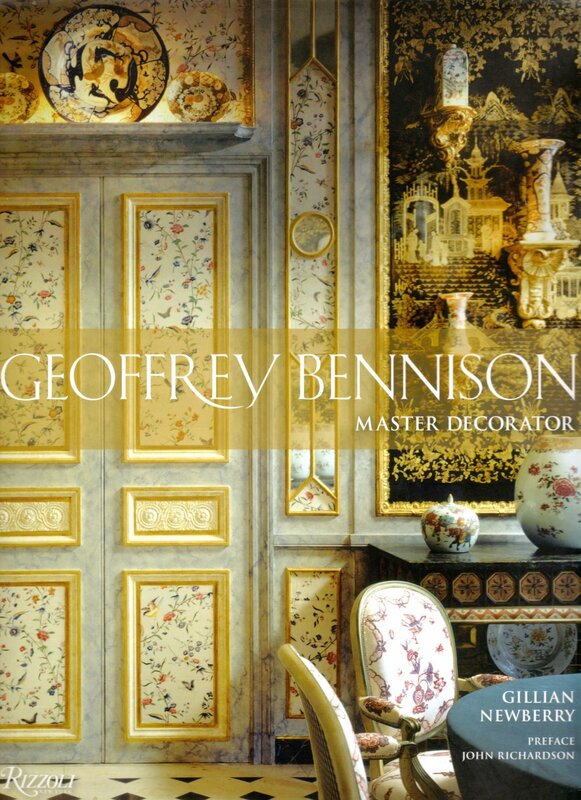 Geoffrey Bennison’s fascinating history all of his works and commissions as an interior decorator have been documented in this beautiful book. Gillian Newberry, who assisted Geoffrey in his shop and with the production of his textiles celebrates Bennison’s legacy and continues his vision and aesthetic as the owner of Bennison Fabrics, recreating the textiles that played such a huge part of his style and success.